The first edition of the home/school SEND Transport Charter for Cambridgeshire launched at the start of February 2018. It sets out the responsibilities of families, the local authority, transport providers and schools and colleges in getting our children and young people to and from school and college. And will be reviewed every three years by the stakeholders, who will also include young people who use the transport, SENTAS, the independent transport advocacy service and SEN caseworkers. Work on the charter started in the summer of 2017 with a series of parent meetings across Cambridgeshire, hosted by Pinpoint and SENDIASS, to capture views and ideas on the service and how it could be improved. One big change is the introduction of individual transport passports for all children and young people who use SEND Transport. Passports will start with new pupils and roll out to existing pupils during the year. Passports will be given to transport companies for their staff to carry on the vehicle. The SEND Transport monitoring team now have built-in checks to look for existing passports as they carry out their checks at schools. The page also has key transport contacts if you have a problem with your child or young person’s SEND transport. SEND home/school transport in Cambridgeshire is provided through the local authority’s transport team, which arranges journeys and vehicles for over 12000 children and young people to and from school every day. There are around 1130 SEND students and pupils, although numbers change due to social services’ client requirements. The transport team is also responsible for around 96 After School Club pupils. In addition, it manages journeys for about 4,500 looked after children (LAC) each month, plus around 2,000 adult journeys a month. It has over 1,000 active taxi contracts running each day (includes, LAC, respite, older people and SEND transport). These are contracted to reputable, licensed operators who agree to the county council’s terms and conditions. The taxi companies are responsible for recruiting drivers and passenger assistants. Recruiting suitable staff to work the limited, term-time hours can be very difficult, so that is why some contracts go to out-of-county providers. Certain areas of the county have no local firms who will employ PAs – which, again, is why they are contracted out to a wider area. However, Cambridgeshire County Council’s SEND transport manager Sue Eagle stressed that the authority has stricter criteria for drivers on Education and Social Services transport than some authorities. For example, anyone convicted of drink driving will not be re-employed for 10 years as opposed to the three years that are normally imposed. All drivers go through a DBS check as part of their licensing with the taxi firm and the council does a further enhanced check on those drivers. Contracts have to be reviewed every three years and re-tendering is now on an individual school (not geographical) basis and will start only at the beginning of the academic year to give everyone more time to plan and communicate any changes. Some drivers and PAs need bespoke or very specific NHS/medical training to safely transport certain pupils with additional needs/disabilities. Last year, the county council organised Autism Education Trust training for 400 drivers and staff. If you have a concern over your child or young person’s transport, do alert the Transport team as soon as you can and the team will do its best to sort things out. All licensed drivers and passenger assistants should be able to provide a photo ID showing DBS enhanced clearance. 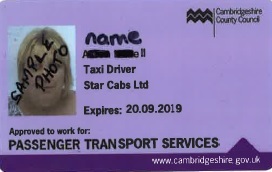 These are purple badges, approved by Cambridgeshire County Council’s transport team. See the sample one here. If your usual driver or PA is sick and somebody new arrives to transport your child or young person without any notice and does not introduce themselves and show their purple badge – please let the transport office know. Usual taxi broken down? Concerned a vehicle is not roadworthy? New vehicle taking your son or daughter to school? Call the transport team. They can make spot checks and award penalties to companies not adhering to the contract agreement or vehicle maintenance regulations. If timings are an issue, or you have concerns regarding staff, medical needs, equipment, pupil behaviour, child protection, Parents should contact transport – numbers and email below. You can also call the SEND Transport team on 01223 715600 or 01223 728553. Or the Education Transport Team on 0345 045 5208. These communications channels are monitored regularly. Email is best as phones are usually very busy. It says that “these seemingly small changes can have devastating consequences for families.” And has therefore produced new information for families, explaining their rights and how to challenge decisions.